0.87 Acres in Beaverton - New Price! The Farmington Land parcel offers developers an ideal opportunity to build a strategically positioned apartment community in a strong suburban location. 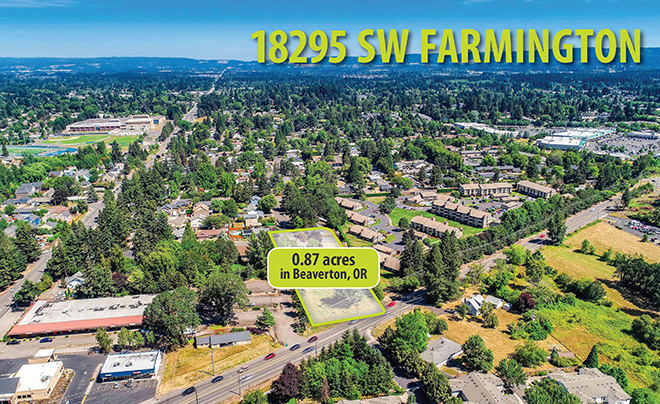 Located near the intersection of SW Farmington Road and SW 185th Avenue in Beaverton, the Farmington Land is 0.87 acres in size and is entitled to 13 townhome apartment units. Seller is willing to sell existing site plans and architectural drawings for an additional $100,000. Each unit has been designed as a two-bedroom, two-and-one-half-bath home with an attached garage. The site further benefits from an easement with the adjacent property to the west, providing driveway access off Southwest Farmington Road. The seller of the property also owns the adjacent Devonshire Manor Apartments and is willing to give a formal easement to run stormwater lines through the Devonshire complex to SW Rosa Road – which would result in significant savings.